The Human Cloud and the Cloud Infrastructure are defining a new alternative to the traditional BPO services in various key segments of work. It is fast changing the dynamics of how the BPO industry operates. Service providers, in order to differentiate and avoid the commoditization penalty, will need to invest in this transformative model to stay competitive. Buyers need to think differently and re-organize their service strategies to be able to benefit from this new paradigm. 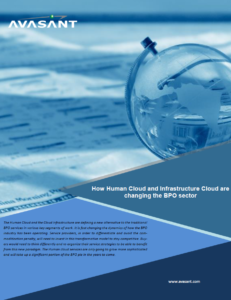 The Human Cloud services are only going to grow more sophisticated and will take up a significant portion of the BPO pie in the years to come.